> and they still don’t have a 2020 candidate. I think that will be the case until Hillary is dead or behind bars. Not only does she still think she is a contender “cause she was robbed, robbed, I tell ya”, but I’m sure she thinks running for office gives her some sort of immunity from prosecution, in that she can claim the prosecution is political. Anyone who tries to dismiss her from the stage is putting their career and possibly their life in mortal danger. I think most D politicians are praying for her demise (figuratively or literally), so that they can run for high office without looking over their shoulder. Now, I do not believe everything is done. We are not entering a Pollyanna world of being close friends with North Korea. Not now but look how we felt about Japan in 1948 - 20 years later we were friends, now absolute allies. 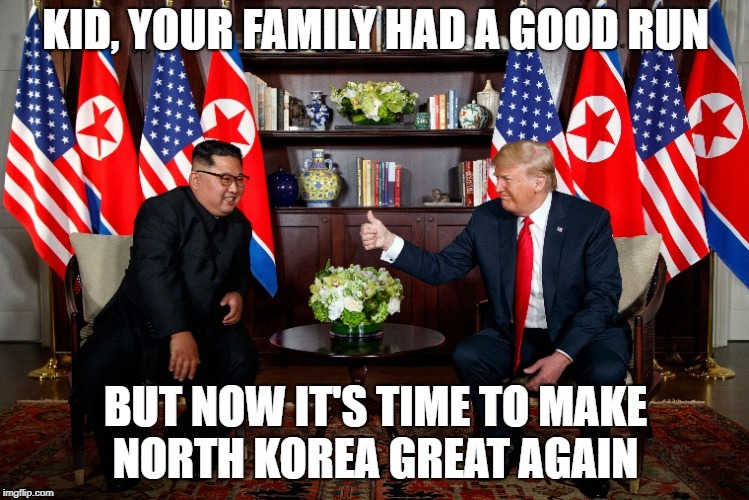 The Korean summit has the MSM at a new low to find something bad to say about our President. It shows their TDS to the country. You’ll never get the granite to do his hair justice! Trump is a great leader. He operates like a businessperson. He sets goals and delegates. He wants to solve problems. I forget who it was...some talking head on tv...who said politicians don't want to fix problems because if the health care or immigration problem disappears, then they don't have anything to run on. I am so thankful that we have a plain-speaking, goal-oriented president with common sense who has the best interests of the country at heart. "Youll never get the granite to do his hair justice!" Trump is all about cutting Gordian Knots, not creating or studying them. Plus he has been giving being POTUS serious consideration for decades along with IDing issues and developing potential solutions. Apparently there are all sorts of media appearances on all sorts of issues. We should also be repeating and reinforcing the points that the MSM utterly ignores. APR 30, 2018, President Trump met with Nigerian President Buhari. Trump asked Buhari if it was true that Christians were being persecuted and attacked in Nigeria, and promised more military equipment deals in their fight against militant Islam. The next day, multiple bombing attacks (using young boys, most likely sent by Boko Haram) killed 60-80 people. The MSM was utterly and solely focused on why the two leaders didn't discuss Trump's "s***hole countries" remark, and decided that the sudden turnaround on the security of oppressed and butchered innocents wasn't nearly as newsworthy. Best POTUS in my lifetime. Two presidents and one community organizer. Well said Chris, that’s why it’s important to enjoy the moment, it’s all we have. ll I can say is that whenever trump is finished with his presidency, I do not want to go back to the way it was before.